A pedal that some players will have been praying for, providing instant 12-string flavour with no faffing. Convincing 12-string-style tones. Lots of variations on the theme available. If it plays an integral part in your original music, or if you play in a covers band that does a lot of Byrds and Beatles, taking a 12-string guitar to gigs is pretty much a necessity. "Overall, the jingle-jangle flavour of a 12-string is here in spades"
However, a different approach is needed for players who favour a little 12-string texture alongside six- string, and since toting a double-neck EDS-1275 isn't for everyone, it's usually down to effects to approximate the sound. 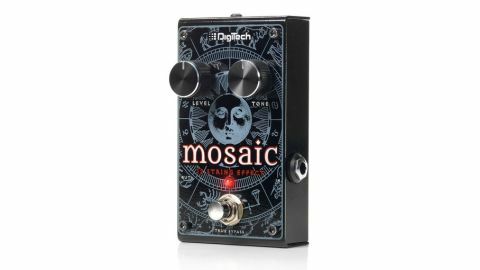 DigiTech might just have made that effects choice a no-brainer with this new Mosaic 12-string pedal. The Mosaic uses polyphonic pitch shifting and intelligent doubling algorithms to create its sound. With processing applied to all strings (rather than just adding an octave to the lower four and doubling up the B and E, like on a physical 12-string), the top two strings, although sounding doubled, do have a certain amount of higher octave there, but that's no problem. Overall, the jingle-jangle flavour of a 12-string is here in spades, instantly delivered on both single notes and chords with excellent tracking. The level knob adds these extra notes to your dry sound, while a tone knob adjusts their high frequency content. Between the two, there's plenty of variation from a subtle Nashville tuning 'ghosting', through that typical chime and sparkle, to brash and in your face. Roger McGuinn won't leave his Ricky at home for this, but the Mosaic represents a great way to get 12-string sounds into a set without swapping guitars.